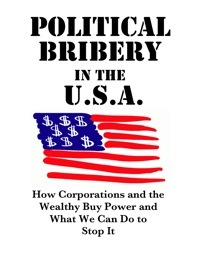 The Alliance For Democracy - News, eNewsletters, Alerts and Chapter News: The return of "Political Bribery"
The return of "Political Bribery"
We're working to update to our 2001 booklet, "Political Bribery in the U.S.A.: How Corporations and the Wealthy Buy Power & What We Can Do to Stop It." The revisions will reflect the new reality of corporate political bribery post Citizens United, and the "case studies" sections will be brought up to date. We aim to make it available as an online download as well as a print publication. Your membership will support this work! Please join now with a secure online donation. To reserve a copy or inquire about bulk sales, please contact the office. We anticipate a single copy will cost $2.75 (postage included), with discounts for bulk purchases.